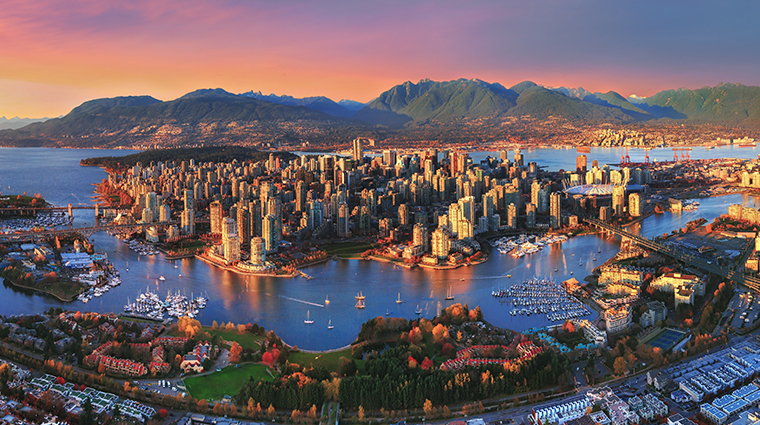 Vancouver is lauded for its enviable mix of laid-back West Coast living and striking skyline, with the snow-capped Coastal Mountains (also known as the Coast Range) as a picturesque backdrop. Surrounded by the waters of the Fraser River and Burrard Inlet, Vancouver has a mild climate and rain forest vegetation that make it an utterly unique North American city. Located on the Pacific Rim, it is a bustling seaport and major trade and tourist destination known for its ethnically diverse population and cosmopolitan urban core. The modern architecture, with glass high-rises dotting the downtown skyline, and lush scenery are so breathtaking, many studios shoot films here. It's an easy stand-in for international cities, earning Vancouver its other nickname, Hollywood North. Vancouver Island, which is the largest Pacific island east of New Zealand, stretches almost 300 miles along the shores of Western British Columbia. It’s easily accessible by ferry from the city of Vancouver, as well as from other parts of the province and the state of Washington. Much of the island remains a wilderness, making it very popular with outdoor enthusiasts. Victoria, British Columbia’s capital, is one of Canada’s most temperate and eminently walkable cities. It has a distinctly British flavor, yet is a heartland of Pacific Northwest indigenous culture. Take a stroll through the lush parks, or a horse-drawn carriage ride through the historic and scenic town that’s filled with bistros, boutiques and colorful alleys.